Symbolically, the egg stands for the renewal of life. Commercially, the term 'egg' refers to hen's eggs. Eggs from ducks, geese, quails, ostriches are also sold but they must be labeled accordingly. Egg is the reproductive body laid by the female encased in a round or oval shell. The egg consists of the thick, clear white (albumen), approximately 60% of total weight of egg, and a yellow yolk, approximately 30% of total weight of egg. The white is 87% water and 10% protein. The protein in egg whites coagulate at 150 degrees F (65 degrees C). The yolk consists of 50% water, 16% protein and 32% fat. The protein in the yolk coagulates at 158 degrees F (70 degrees C). Eggs, as well as flour, are the structural ingredients in baking. Eggs provide leavening; add color, texture, flavor and richness to the batter. They are very important in helping to bind all the other ingredients together. Beaten eggs are a leavening agent as they incorporate air into the batter, which will expand in the oven and cause the cake to rise. Some cakes use beaten eggs as their only source of leavening. Eggs are also used as a thickener in custards and creams, and to glaze pastries and breads. Egg whites are used to make meringues. Eggs are inspected and graded according to their freshness and quality. The color of the eggshell (brown or white) is determined by the breed of hens and they have the same nutritional content. The color of the yolk is dependent on the hen's diet. The grading system established by the USDA is AA, A, and B and refers to the egg's exterior and interior qualities, not the size of the egg. The egg size ranges from jumbo, extra large, large, medium, and small. Grade AA means the egg has a firm yolk and a thick white, which does not spread. Grade A eggs have round yolks, thick whites, but have more thin whites than Grade AA. If the egg carton is labeled "fancy fresh" this means the eggs are less than 10 days old. Always check the carton of eggs before buying to make sure there are no cracked eggs. Eggs must be refrigerated and usually keep one month refrigerated. Eggs shells are porous and therefore pick up odors easily, so store eggs in their carton away from strong odors (e.g. Onions). Do not store eggs at room temperature, as eggs will deteriorate more in one day at room temperature than one week refrigerated. Once cracked, eggs will keep in the refrigerator a couple of days if tightly sealed. Leftover egg whites can be stored in a tightly sealed container in the refrigerator for 7-10 days or frozen for a month. A good way to freeze egg whites is to place them in individual plastic ice cube trays. Once frozen, transfer the whites to a plastic freezer bag. To thaw, simply place in refrigerator overnight. After freezing, the whites tend to be watery and are best used in recipes where the whites are not the sole leavening agent. Eggs contain a yolk and a white (albumen). The egg yolk is rich in fat and a source of vitamins and minerals. A fresh egg yolk will be rich in color and will stand upright with little spread. Blood spots are not harmful and will disappear with age. Egg yolks add tenderness and color to baked goods. Some recipes call for beating egg yolks and sugar until thick, light, and forms a ribbon. This means beating the yolks and sugar together until the batter will drop from the beaters in a slow ribbon-like shape (this takes about five minutes at high speed). The egg white is mostly protein. To get maximum volume when beating egg whites they should be at room temperature and make sure your bowl and beaters are clean and free of grease. Copper is the best type of bowl to use. If whites are over beaten the protein molecules will lose their elasticity and the whites will become dry and flaky and won't hold as much air. If this happens, add another white and beat again only until the whites are creamy and glossy. When adding beaten egg whites to your batter, always fold the whites into the heavier mixture. Not vice versa. Fold gently and quickly so as not to deflate the mixture. Add the egg whites in three stages using a rubber spatula. Cut down and through the batter making sure not to over mix. A few unmixed parts are fine as the most important thing is not to deflate the egg whites. It is best to separate eggs when they are cold. Make sure you do not get any yolk in with the white, as it will reduce the volume of the whites when whipping. When separating eggs have three bowls ready. Crack the egg in half and let the white drain into one bowl by transferring the yolk between the two halves of the shell. When done, put the yolk in the second bowl. When breaking the second egg, use the third bowl for the new egg white, so if some yolk gets mixed in with the white, you have not wrecked all your whites. If you do happen to get some egg yolk in with the white, remove the unwanted yolk by using an empty eggshell. Egg yolks will immediately start to form a skin after being separated. Cover the yolks with plastic wrap, if you need to bring them to room temperature before using. Always use the size egg that is called for in the recipe. If the size is not given, assume it is large. Most eggs used in baking are at room temperature. A quick way to warm eggs to room temperature is to place them in warm water for 10 - 15 minutes, or else leave them out for 30-60 minutes..
"Love and eggs are best when they are fresh." 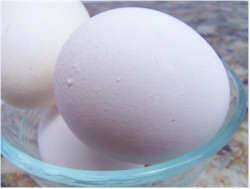 Freshness Test: Place an egg in water mixed with a little salt. If the egg is fresh it will sink. The quicker or farther it sinks, the fresher it is. If the egg floats, it has spoiled. TIP: Cold eggs are easier to separate than warm eggs. TIP: For half an egg - lightly beat one egg, then measure out 1 1/2 tablespoons. TIP: To achieve maximum volume when beating eggs, have them at room temperature. TIP: Always use large eggs in recipes where egg size is not given. The size of the egg used will make a difference in the consistency of the batter and ultimately affects the outcome of the baked good. Some cookbook authors just assume that everyone will know to use large eggs in their recipes. - Have a clean copper or stainless steel bowl and beaters. - Separate eggs when cold and then warm egg whites to room temperature before using. Make sure there is no egg yolk in the egg whites. Copper is best for whipping whites as it reduces the time it takes to whip the whites and also stabilizes them. Stainless steel when used with cream of tartar and sugar also does a good job of whipping and stabilizing the egg whites. Don't use a aluminum bowl as it gives the beaten egg whites a grayish tinge as some of the aluminum does come off during beating. Plastic and glass are not good surfaces either as the whites tend to slip down the sides of the bowl and plastic attracts grease because of its porous surface. When separating the cold eggs, make sure no specks of egg yolk get into the whites or they will not whip to their full volume. Remove any yolk with the edge of the empty egg shell. Bringing the egg whites to room temperature before whipping ensures the whites will triple in volume. Start beating the egg whites at low speed, gradually increasing the speed to medium-high. If you start at high speed the air bubbles created will be less stable as they are too large. Adding cream of tartar (1/8 teaspoon for each white) and sugar will help stabilize the beaten egg whites. Cream of tartar should be added once the whites are foamy. Continue beating the whites and once they have reached the soft peak stage, gradually add the sugar (this ensures that the sugar fully dissolves into the foam). The egg whites should be beaten until you have moist stiff shiny pointed peaks when the beaters are raised. Perfectly beaten egg whites produce a baked good that has good volume and texture. The foam needs to have a stable structure so it maintains its volume until the batter sets in the oven. Always use the beaten egg whites right away as they start loosing volume immediately. If you accidentally over-beat the egg whites, add one unbeaten white and whip again until stiff peaks form. Remove 1/4 cup of egg white. Note: Cream of Tartar - Lining the inside of wine caskets after fermentation is a white sediment (tartaric acid). This sediment is removed, purified and then ground to produce a fine white powder which we call cream of tartar. It is added when beating egg whites to stabilize the whites and give them volume and strength. Cream of tartar can be found in the spice section of most grocery stores and should be stored in a cool dry place.